The heroine is an ordinary student. One day, she finds herself got thrown back in time to an old era, about 500 years before, known as the “Warring States” period. She meets ninjas who are fighting and risking their lives in major battles. 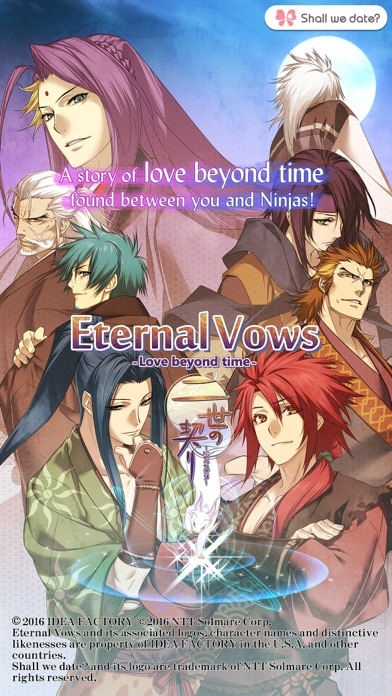 A bitter-sweet story of love beyond time found between the heroine and the ninjas is now about to begin!! 1. Story Introduction The heroine of this story is an average student and a member of her school’s archery club. In a sudden twist of fate, she finds herself leaving her uneventful life behind, being thrown headlong through time to medieval Japan. In this time, known as the “Warring States” period, continued civil war ravages with no end in sight. She appears in this time right at the feet of Masatora Uesugi, later known as Kenshin Uesugi. Masatora takes an interest in her bizarre clothes and way of talking, brings her back to Kasugayama Castle and places her under guard of the “Nokizaru”, a unit of ninjas. Although life in this war-torn era is not something she has ever expected up until now, she does her best to stay positive. She finds a place for herself by connecting with the people around her, eventually understanding and feeling the importance of the bond with them. 2. Characters *Akatsuki (Nokizaru): The prospective head of the Nokizaru. He sounds overbearing, yet is straightforward and considerate in nature. He cares about his comrades, and once he trusts someone, he takes care of him or her for life. 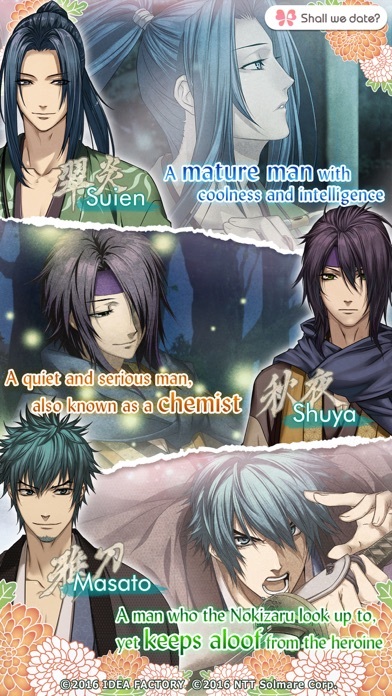 *Suien (Nokizaru): A man with a laid-back personality who is kind to anyone. He loves playing the flute, and teaches his knowledge to children. *Shuya (Nokizaru): A man of few words. With a dead-serious personality, he places orders before all else, yet takes good care of the younger ones. He also plays an important part as a chemist. *Masato (Nokizaru): He is a strong and skilled man above all, and is acknowledged by others. Ever since he first met the heroine, he somehow places a distance between himself and her. *Yataro Kojima (Captain of the foot guard of the Echigo Army): A massive man who serves Masatora from a young age. He is friendly and watches over the heroine along with his younger sister, Princess Aya. *Kanehisa Togi (The former master of Nokizaru): A man with a very strict personality. Only partially retired, he continues to assist the young Nokizaru. All of them stand in awe and respect him. *Kansuke Yamamoto (A strategist of the Takeda Army): A man of mystery. Although he serves Shingen Takeda for many years, he looks ageless. He takes an interest in the heroine and tries to approach her. *Rurimaru (Nokizaru): A bright and energetic boy, loved by everyone. He is not skilled enough yet, and is treated like a younger brother by others. He gets along well with the heroine like brother and sister. 3.FOLLOW US facebook.com/ShallWeDate.NTTSolmare (Don’t forget to LIKE us if you enjoy our games!) youtube.com/user/ShallWeDate 4.ABOUT US Thank you very much for your interest and downloading our games! NTT Solmare is a game company especially focusing on bringing Japanese visual novels and Otome games to the world! 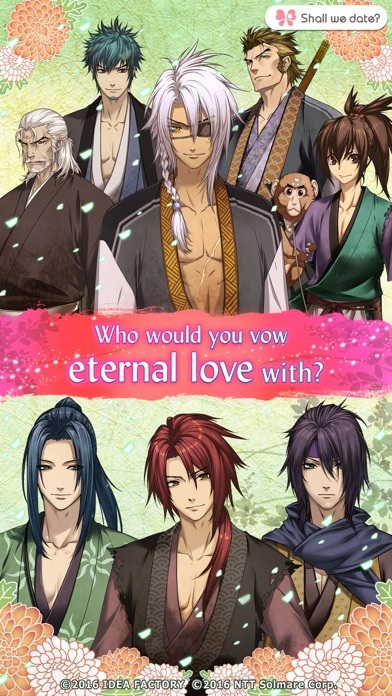 Eternal Vows -Love beyond time- is one of the titles from our game series, “Shall we date?”. We sincerely hope you enjoy our games and give us feedback! I bought the package deal.... was going great, till all my photos I unlocked are now locked again! Completely bogus. Waste of money that I could of spend on a better story with more diverse story for each different route. I would love to give it four but this happened. I recommend you get this fixed cause it’s a huge feature for the app. Thank you for reading. I'm only giving this two stars because the art is beautiful. I'm really sad cuz I wanted to read it.. but you have to pay five dollars for the stories. I'm not paying that! There are better Shall We Date games out there that are free! Having a little buyers remorse so I'm starting starting off with the cons: -little romance though out. -If you purchase a character package the UI is weird and makes you play all stories as one package (please fix this!) -plot can be confusing, sometimes it hard to figure out who is talking. I constantly found myself going back to the character chart -character paths didn't always show your character in the chapter. I got confused on if I was even doing well constantly. -too much background story made it confusing to follow too. Ok, if you're still interested here are the pros: -beautiful design and imagery -liked how the MC wasn't a total cry baby the whole time. She at least had a backbone in comparison to MCs on other apps -nice music -pretty cg images Overall, not super impressed. I felt like this under delivered. The stories great to a point but the lack of detail makes it hard to become a truly interesting tale. I tried Kansuke and I'm not really sure if that's where I went wrong. His story hardly has him featured, and after playing through 5 times, the last time with a walk through, I still got a sad ending. Which in itself is so horrible that it's made me leery of buying any of the others. There's no meter to show progress or anything. Compared to Princess Arthur I'm not sure it's worth the money. But if you like tragic love I guess it'd be a good choice. I want to say right out that this is a localization of the famous Japanese otome game Nise no Chigiri. Pretty sure it's by Idea Factory and Otomate... So yeah, the development is slow in the romance department but the story is rich and interesting. 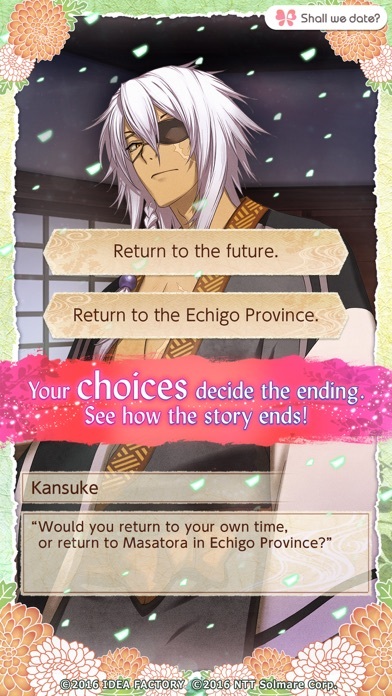 Think Hakuoki in terms of romance. ALSO, in the original game, I don't think you choose a route right off the bat. So yeah, very very little romance until you're really into the game because you probably haven't "officially" chosen a route. That being said, the artwork was amazing. The story was great and the music was nice. I wish they had kept the voice acting, but I understand that it would have been expensive. Good translations as well. 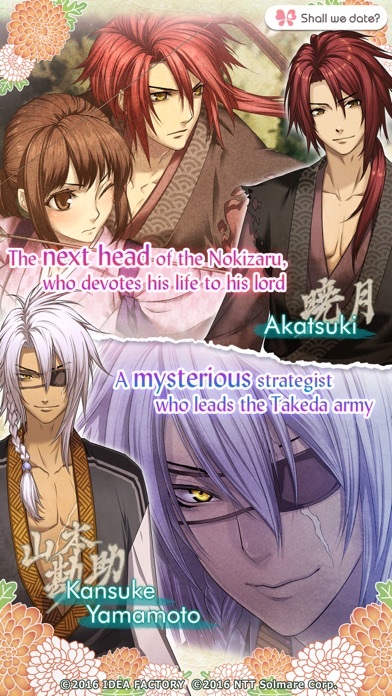 Highly recommend if you liked Hakuoki or any other NTT Solomare localizations (Scarlet Fate and Demons' Bond I think it's called??) NTT Solomare: please keep localizing more Japanese games!!!!!! I was under the impression that I was buying a 15-chapter romance story. However, the heroine did not even interact with the character I selected (Sir Toji) until chapter 11. It's a fun adventure tale, but not at all the romance story I thought I was buying. Perhaps there's a more developed romance story if you choose a different character, but I'm not willing to spend any more money to find out. I also wanted something I could read quietly on the subway, but any time something "shocking" happens in the story the app makes your phone vibrate 3 times. This happens even with your phone muted. There is no way to turn this effect off, either. Certain chapters include so much of this vibration effect that my phone was practically buzzing out of my hands and strangers started asking me what I was playing. It was basically an introvert's nightmare. The only thing I would love even more would be if the heroine could fall in love with Lord Kenshin.